Mini-me loves to dance. She really thinks she is a beautiful ballerina, leaping and prancing about. 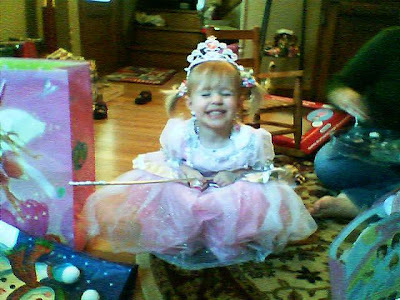 Sadly, that illusion crumbled last night as her clumsy 3-year old self took over and crashed into a table. She hit her forhead pretty hard and had to go to the ER for stitches. She was a champ. She cried a little when they took the bandaid off, but that was because it was stuck to a little bit of her hair. The nurse put her in a papoose, so that Mini-me wouldn't roll or kick or bite, and then kept asking her about princesses to distract her. The PA, Bob, put liquid stitches on the wound and within minutes she was all better. Nurse Laurie gave her a popsicle and a Barbie sticker and sent us on our way. It may be a little tender today, but Mini-me says it feels fine. Now all of our kids have visited the ER. I think one visit a piece is plenty, don't you? What do they put in McDonalds hotcakes to make them smell like yellow cake? Why is baby throw-up called "spit-up?" Do they think it's cuter because it's from a baby? Why do people say "slept like a baby" when they mean they slept really well? My baby is up every few hours. Why do they still teach cursive? Is it so people can give autographs? Hope these burning questions keep you warm on this freezing morning! There are many movies I quote in life. Not everyone gets my references, but usually I can count on my family to understand. This week I have been quoting "What About Bob?" an unusual amount. Bob has much to offer by way of quotation wisdom. For example, Bob teaches us how to treat a hostess: "Umm. Ummmm. Is this corn hand shucked?!" Bob teaches us to be exuberant: "I'm sailing! I'm sailing!" Bob also teaches us that sometimes we need a break: "I'm taking a vacation; from my problems." That's what I've done this week. I've gone on vacation. I didn't go far and I didn't take much with me. I'm not gone for long, because you can't outrun your problems forever. But when you take a vacation, sometimes when you come home your problems seem a little more managable. But for now, let's keep the cold drinks coming and the movie quotes flowing. I'm on vacation. I would post a picture here, but it would be the same picture as last week. There was no time to baste the quilt together. Basting usually takes me a couple of hours for a baby quilt, and it takes up a lot of space. So, I couldn't start it, then leave it and come back to it. Too much mess. Hopefully I can get to it this week. Saturday was the start of the stitch-a-long at the cross stitch shop. We are doing Ezmeralda's House. I decided to do mine over one using one strand of floss. That makes in tiny. I think I am using 38 count linen, but I could be using 32. Can't remember. Everyone in the group is doing something a little different with theirs to make it unique. One woman is using bright purple linen, one woman is using what the pattern calls for, one is using green. You get the point. The colors are very muted, so I thought I would try it on black (it is for Halloween, after all). The colors really pop against the dark background. I need a lot of light, however, because the holes are so small and so dark. I suggested that we all finish in time and submit them to the county fair to be judged against each other. There are some talented stitchers in the group, so I would enjoy knowing I could beat them all. Just kidding! I would, however, like to know how the judges thought I stacked up. Curly's in the news. Again. Here's one of the many articles. Opening night went well. They received a standing ovation. People said it's the best show Way off Broadway has done. That's saying a lot. They put on some great productions. Could you just die for that bald head? 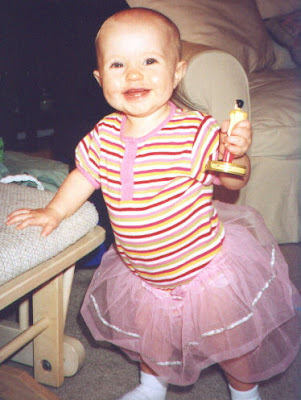 And, even from this age, she loved being a princess and dancing! A couple of years ago, my mom and I went on a cross stitch retreat. It was so much fun. We went to Vermont, which must be beautiful this time of year, all that snow, and stayed in the Woodstock Inn. We were joined by stitchers all over the country. Of the classes that were offered, we took two from JBW Designs (the designer, Judy, was featured in this months Just Cross Stitch magazine) and one from The Heart's Content. Judy and Maureen were both lovely women. Over 2 full days, we took 3 classes, shopped at the retreat store, listened to some beautiful mountain dulcimer music, and ate ourselves silly. We learned new stitches, and new ways to do our old stitches. And, as an added bonus, if you look at the pictures, you can clearly see that we are the thinnest (and cutest) women at the retreat :) We wanted to attend last year, but it didn't work out. I am dying to go this year, the 10th anniversary year, but I have a baby. How about next year? It won't be as big as the 10th anniversary year, but it will be as fun as 2005. Would anyone like to join me? How 'bout it, Mom? Jenny went well today. Not only did I lose the 4 pounds I gained over the holidays, but I lost another half pound to boot. Hooray! I really want to look good at the wedding at the end of May. I want to fit into my cute Anne Taylor skirt with the big purple flower. I think I can, I think I can, I think I can. I have made some good progress on the quilt this week. I pieced the entire top together. I would have it all basted and outlined out, but I forgot to take the batting out of the bag until yesterday. It needs a good day to relax, so I'll baste it tonight or tomorrow. You could waste hours on a site like this, where you paint your own little guy and watch it dance. It reminds me a lot of that old paint program that was on our first computer. You could paint a masterpiece with that. Tonight Flower and Mini-me were fitted for their flower girl dresses for the Kiska wedding in May. The very gay Joey at David's Bridal gave them a little veil to wear, only he didn't call it a "little veil." I think he called it a "blusher." They looked so beautiful, and they knew it. Mini-me could hardly rip herself away from the mirrors. We wanted to try a variety of headbands, but she resisted each time we changed them. Every one was her favorite. They both danced like they were part of a Disney Princess movie. Curly had a little tear in his eye imagining the day we will go pick out wedding dresses for them. With how they acted at dinner later, that day is far far in the future. This will be Flower's 6th wedding she will be in. She's such a pro, I wonder if she'll grow up to be a wedding planner. 1. "I feel dangerous." Mini-me says this she doesn't want to do something. 2. "Whole live world." Flower says this instead of "whole wide world." Somehow it fits. 3. "This is my prince." Said once upon a time by Flower and now by Mini-me, referring to Curly. Patch has the stomach virus that has been going around. As we near the end of day 2, I find myself asking: How much poop can one kid have?? He is finally napping. The fear that everyone else in the house will also fall ill grips me. We may have to go into quarantine! And now a note to Curly's brother Shane. It's okay that you won't be a pilot. I know we had dreams of "KiginAir" where you would fly us and Colleen would serve us drinks. It's hard that those dreams have ended. I think I'll be okay with time. Maybe instead they'll teach you how to pilot a boat and then you can start "Kigin Cruises." That would be fun. And maybe Colleen could still serve us drinks! Hope surgery goes well. We're thinking of you here. Last night, Rebeccah, Michelle, and I started our Pilates class at the YMCA. It's a 7 week class. Here's our "before." When I began this blog a few months ago, my cousin suggested I take a weekly photo of my current project. So, here is the beginning of Patch's quilt. Hopefully the weekly photo will help keep me motivated to work on it more often. Last night was my book group night. It was my turn to host (love getting it done early in the year) and I served my chocolate fountain with delicious treats to dip in it. We had pretzels, peanut butter balls, shortbread cookies, bananas, and cheesecake. It was delicious. Our January book was Gift from the Sea by Anne Morrow Lindburgh. It was quite good. She had a lot to say about life and a womans role. Considering it was written in 1955, it was quite relevant to now. After book group was over, a few of us started to discuss a future NYC trip. Look out! We're coming in April! My job is to choose the show. I think I'm going to pick The Drowsy Chaperone. A couple of ladies want to see Wicked, but since I've already seen it, I may break off from the main group and see a different show. Usually we stay in New Jersey and take the ferry over when we go, but this time we have a hotel connection and will stay in the Marquis. How fun! This time is also a bit different, because we'll be starting the trip a bit more spiritual. We've decided to do a Friday night session in the Manhattan Temple. We'll have to make reservations before we get there. How great is that? I love my friends. When the temple was brought up, no one scoffed, no one said "Ugh. Do we have to do the churchy thing?" They are such wonderful women and I hope I am gleaming their good qualities from them. 2. Santa's Magic. I've had this one in my stash for years. I think it could take home the Best of Show ribbon at this years county fair! 3. Snapperland. It started with Snapperville (which I am almost done with), then expanded to seasonal scenes of this little town. It reminds me a lot of Frederick. I have winter and spring in my stash. My little goal for myself is to finish those before I purchase summer and autumn. Last night as we came home without Flower, our house felt so empty. She's such a bitty thing, but she takes up a lot of room! Right now the house is totally quite. It hasn't been totally quiet for about two weeks. Luckily she gets to come home on Friday and stay the whole weekend. I have piles of stuff all over my house. There are piles of laundry waiting to be taken upstairs and put away. There are piles of Christmas cards, waiting for something to happen (I vote for throwing away, Curly votes for keeping). There's a pile of bills, waiting to be paid. There are piles of doll clothes. There are piles of Christmas boxes awaiting a trip to the attic. Looking around at the piles makes my resolution seem a bit challenging. But, I have 12 months to accomplish my goal. That's a lifetime! Mini-me is back at school today, but Flower has one more day of break. She was disappointed not to be going back because she misses her mom. So, instead of making her wait until after school tomorrow, we've arranged for Ex to come pick her up tonight as a surprise. Flower will be so excited. In the meantime, we are making today as fun as possible. We are going to the vet (not so fun), to the quilt store, and to get me a Big Gulp. Then, we will come back here and start working on our quilts (we have at least 3 to do). Flower also got a cross-stitch kit for Christmas that she's anxious to get working on, and a decorate your own tote bag kit. I think we'll do the bag first, and then she'll have a place to stash her stitching. Time to round up the managerie. Both animals get to go today. York (the cat) will hate it. Gracie (the dog) will love to torment York. To add insult to injury, York has to go in the pet carrier that is normally Gracie's "house." Poor cat. Is it "New Year" or "New Year's"? Well, whatever it is, I hope it's a great one for everyone. 2007 is my year, I can feel it. I have one resolution this year: to reclaim my house. I have been a lazy housekeeper for the past, well, since I've had a space to call my own. I do the minimum. I dust when it's really dusty, I vacuum when I can see dirt on the floor. Well, no more. You are all my witness. One day at a time, one room at a time, my house will no longer hold me hostage. I'm the boss. Who's your mama now? Here's the major catch: at no time is this blog entry to be taken out and held over my head. No fair trotting it out to win an argument, or prove a point. There will be no passive-agressive "So, who's winning? You or your house?" There will be times where resistance will be futile, but by gum, this time next year I hope to not make the same resolution!